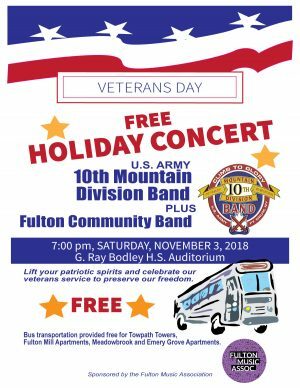 FULTON – The U.S. Army’s 10th Mountain Division Band from Fort Drum and the Fulton Community Band will perform a free concert in honor of Veterans’ Day, on Nov. 3, sponsored by the Fulton Music Association. The concert is scheduled to begin at 7 p.m.at the G. Ray Bodley High School auditorium. FMA is providing free bus transportation to and from the concert for residents of Towpath Towers, Fulton Mill Apartments, Meadowbrook and Emery Grove. The Fulton Community Band and the U.S. Army 10th Mountain Division Band will combine for this concert; conducting will be shared among several members of 10th Mountain and Carol Fox, Fulton Community Band director. The U.S. Army’s 10th Mountain Division Band from Fort Drum and the Fulton Community Band will perform a free concert in honor of Veterans’ Day on Nov. 3. The first half of the concert will feature a 10th Mountain Div. small chamber ensemble. The second half will be a performance by the combined bands. Fox will conduct National Emblem and Light Eternal, as well as America the Beautiful. Specialist Michael Zuniga will conduct Irish Tune and Shepherd’s Hey. Be Thou My Vision will be conducted by Staff Sergeant William Karsten. Silver Quill march will be conducted by Staff Sergeant Shawn Trumbo. Chief Warrant Officer Two, Daniel R. Parker, will conduct Armed Forces on Parade and Stars and Stripes Forever. During Armed Forces on Parade, veterans and active military will again be asked to stand during their branch’s theme and be recognized for their service, as has been the tradition at this concert. Based out of Fort Drum, The 10th Mountain Division Band has provided musical and operational support while being deployed to Kosovo in support of Operation KFOR, Pakistan for support in response to the earthquake that rocked the area in 2005, Iraq in support of Operation Iraqi Freedom, and 3 deployments to Afghanistan to support of Operation Enduring Freedom. These professional Soldier-Musicians are trained and ready to deploy anywhere in the world. 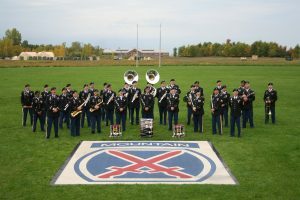 The musicians of the 10th Mountain Division Light Infantry Band provide a wide range of musical support for the soldiers, as well as the citizens, of the North Country. The Fulton Music Association is dedicated to promoting music in our schools and community, Steve Chirello, president, said. For further information, call Fox at 591-3392, visit The Fulton Music Association on Facebook, or visit www.facebook.com/10thMtnDivBand.